Now this wall quilt combines conductive thread and all sorts of neat tricks. Stuff trying to stitch wires to the back of your work, this stuff goes straight through the machine! YUSS!!! Now I will give kncjdavis all the kudos in the world for the mad creativity for figuring this stuff out. 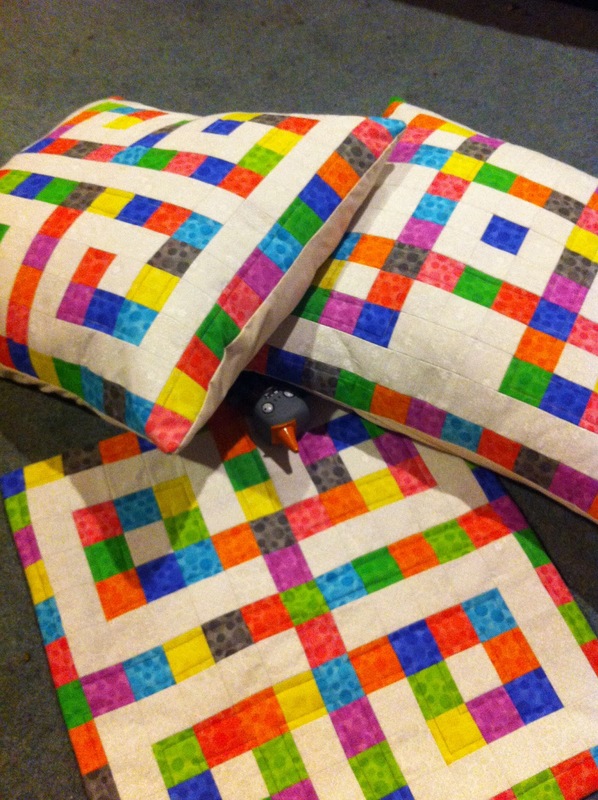 But I hate to say it, the quilt itself is a wee bit beginner-level for me. So, no photos to post yet, but I have a new wall-hanging for Christmas now on my projects to start list. In other news I have 3 of the four cushion samples completed thanks to the wonderful blisters, and I'm working through the sofa throw for my first set of patterns! I hope to have the patterns available for sale very very soon. And if you look closely there is a little hint for the likely theme for my next set in there. I'm about 1/4 done for the sofa throw and the last cushion is being made by another friend. Helper #2 is posing beside my stack of QAYG blocks for my Saturday Stitchy ladies quilt. Now to hack them apart and stick them back together again! There are several designs on the front and back of that I am seriously considering stealing!